Earlier this month I was contacted by a nice lady from Technorati who invited me to contribute some writing in the Lifestyle and Women's sections. I was a bit surprised because the articles I've seen on Technorati all seem to be quite sensible and newsy which is not my style at all. In my pursuit of an ecological halo, I bought a bag of soap nuts this year. The blurb announced that they are supposed to clean as well as normal soap powder. Whoever wrote the blurb obviously doesn't have boys chez lui. Boys with feet. Boys with ever-growing, ever-dirty feet. Feet that, clad in only in socks, will dash about outside - in the garden or in the road - because it's too much effort for the boy attached to a) find his shoes, b) be bothered to put his shoes on. The result is socks that present a serious challenge to cleaning products. The white ones turn a muddy grey, with dirt so ingrained that only a bleach blast could have any possible hope of restoring a degree of whiteness. But there is worse. The smell. Where does the smell come from? The gut-wrenching mixture of potent cheese, rotting vegetation and festering sewer. The smell is transferred from socks to feet to shoes. The whole chain is infected with it. 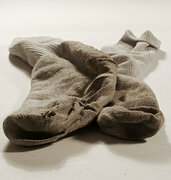 Dirty feet in dirty socks are shoved into increasingly dirty shoes which perpetuates the cycle of stink. Some shoes you cannot wash so once infected, they nurture the smell and resist all efforts to disinfect. Socks, on the other hand, can be washed, but you'd never believe it given the results from washing with soap nuts. Poor little soap nuts. Boy socks are their Waterloo. They simply cannot cope. You load the washing machine with hope as well as dirty clothes. You add the little bag of soap nuts, with a few words of encouragement because what they are required to achieve is beyond the call of duty - Breaking the Cycle of Stink. Later, when the machine has stopped, and is waiting expectantly for you to free it of its load, you take out a sock and sniff. As you feel you heart drop with a thud to your boots, you realise that the only difference between the sock you put in and the sock you've taken out is wetness. You are holding a wet smelly sock, a sock that has been whirled around in 40°C water with a bunch of soap nuts for an hour and a half. To no effect. They are even only mildly less muddy. With the next load, you feel your ecological halo slip as you resort to a heavy duty chemical tablet. Yet the smell lingers despite the beating it gets from the best that the chemical industry can throw at it. I give up. Those socks are destined for the bin. Neither ecologically nor economically sound as a solution, but the only lonely answer to breaking the Cycle of Stink.